This thoroughly weatherized display proved tough enough to survive a rare California hailstorm and tornado warning, too. Moving a TV from your living room to your patio to watch the big game is one thing; installing it there permanently—unprotected from rain, snow, insect infestation, and other hazards—is something few of us would risk. But that’s just what Sunbrite’s SB-4670HD is designed for. 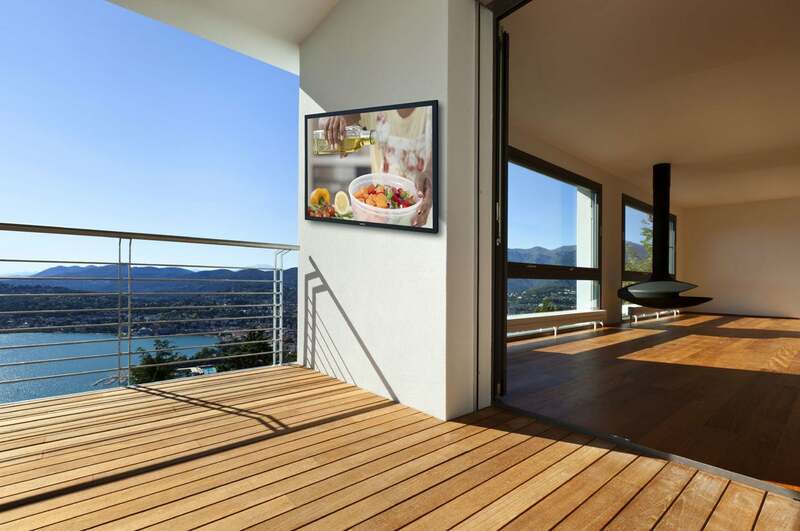 This 46-inch, 1080p display can be installed and operated in outdoor locations where it’s completely exposed to the elements. Sunbrite starts with a third-party public information display (PID), an LED-backlit LCD panel that delivers a higher level of brightness to compensate for the fact that it will be installed outdoors, where it will compete with the much stronger ambient light of the sun during daylight hours. The company says it sources its panels from a variety of manufacturers. It then wraps the panel in an outer skin that gives the finished product an IP55 rating. IP stands for ingress prevention, and the first digit indicates how strong the enclosure is at preventing solid objects from getting inside. The second digit rates the level of protection against liquids. 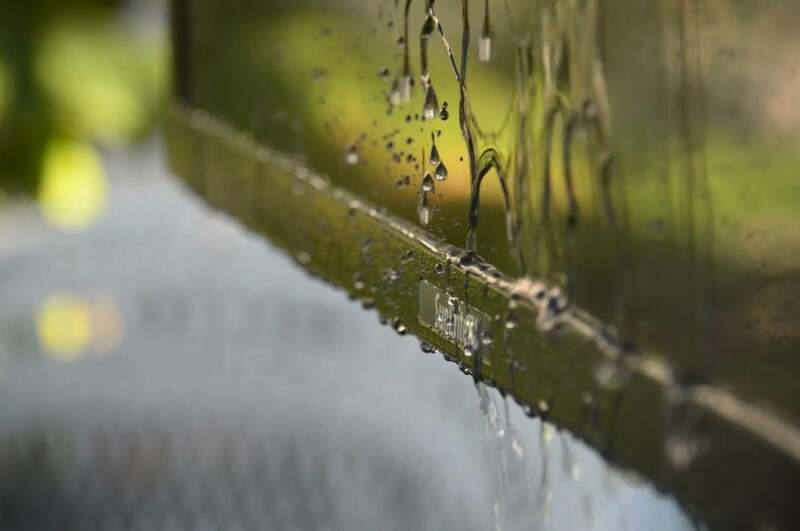 An IP55 rating means Sunbrite’s enclosure provides limited protection from dust ingress (and that no harmful deposits will be left behind), and that it delivers protection against high-pressure water jets from any direction (limited ingress is permitted). Basically, you can leave the TV exposed to the elements—including rain and snow—without worrying that water or flying dirt from a lawn mower or leaf blower will destroy it. And when it gets too dirty for a simple wipe-down, you can hose it off. This TV is obviously not entirely hazard-proof, however; a flying rock or an errant baseball could dent the enclosure or—worse—break the panel’s glass. Why the high price tag? Sunbrite has 4K UHD models in the pipeline, but in spite of its lofty $2895 price tag, the SB-4670HD is a 1080p model. It’s not a “smart” TV, either. It’s equipped with an ATSC/NTSC/QAM TV tuner; but if you want to stream video from Netflix and other services, you’ll need a streaming box. So why is it so expensive? A PID panel clearly costs more than a consumer model, and Sunbrite’s weatherized, powder-coated all-aluminum enclosure can’t be cheap to fabricate and install, either. 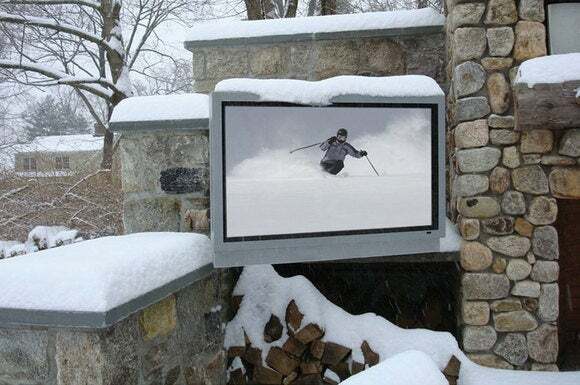 In addition to weather, the company warrants that the TV can withstand exposure to salt air and extreme temperatures ranging from 24 degrees below zero to 122 degrees Fahrenheit. The TV’s power cable is permanently installed and emerges from a weather-proof socket on the side of the enclosure. Opening a hinged door on the back of the enclosure, secured by two retention thumbscrews, exposes the TV’s cable compartment. I was surprised to see that the door opens from the top, with its hinge at the bottom, and that there’s no real provision for the cables to exit the compartment—you just close the door and hope the surrounding foam-rubber gasket seals around them. You can see where the foam-rubber gasket at the top of the cable compartment was indented by the cables emerging from the top after I closed the door. The fact that the TV’s inputs face up ameliorates this situation to a degree, because it more or less forces you to bend the cable into a drip loop. If water does travel along the cable into the compartment, gravity will pull it down to the drip loop where it will drop to the bottom of the compartment and drain out through a pair of screened weep holes on either side. The compartment, incidentally, is large enough to also house one of the smaller streaming boxes. I was able to fit a Roku 3 in there, but the Roku 4 was too big. The SB-4670HD is outfitted with just two HDMI, two sets of component-video, one S-Video, one composite-video, and one VGA inputs. 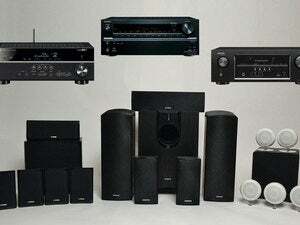 A pair of speakers driven by a 20-watt amplifier are located on the back of the enclosure, but Sunbrite provides RCA stereo audio outputs paired with the component-, composite-, and S-video inputs; and VGA inputs. Since it would be problematic for me to temporarily hang the TV on an exterior wall for this review, Sunbrite also provided a beefy rolling cart for me to mount the TV to (incidentally, don’t forget to take the cost of a mounting bracket or stand into account when budgeting for this purchase, because it stand on its own). But without a surface for the speakers to bounce sound waves off, the TV’s audio didn’t carry far enough—or at least not far enough in the right direction—to carry dialog when it was outdoors. 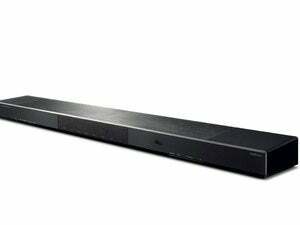 I don’t think that will be a problem in most installations, but if it is—and you’re using the HDMI inputs, as most people will—you can connect the TV to a more powerful audio system using the TV’s 1/8-inch headphone output or its fixed-level coaxial digital audio output. You’ll also find a USB port in that compartment; but it’s marked as a service port and won’t power a Chromecast or other video-streaming stick. Two final ports that will be of interest mostly to custom installers: An RS-232 serial port and an infrared window, both of which provide alternative means of remote control. Speaking of remote control, the provided remote is also weatherized. Rain would quickly destroy an ordinary TV, but the Sunbrite can withstand rain, snow, and extreme temperatures, too. I decided to press the issue to see how well the TV would perform, so I set it up on my driveway at about 2:00 in the afternoon, with the screen facing southwest—directly opposite the sun, which was high in the sky. To my surprise, I could still see the screen well enough to watch part of the NFL play-off game between the New England Patriots and the Denver Broncos. A non-glare coating helps this effort, but I wouldn’t say it was the greatest TV experience I’ve had. Still, I could at least see what was happening on the field. I gave in after about 30 minutes and moved the TV to a more hospitable location: the eastern side of my house, where the TV was shadowed by the house itself (did I mention I was using a long coax cable?). The experience here was closer to watching the game indoors. I found the color to be slightly exaggerated, and the black levels were weak compared to most of the indoor sets I’ve seen lately, but the TV had no problems keeping up with the game’s motion. The set also offered very good off-axis viewing, and the fact that it was bright enough to see in broad daylight was an impressive feat in its own right. Sunbrite recommends installing the TV under an eave or covered patio to shade the screen from direct sunlight. After the sun set, we gathered around a clay chiminea, I logged into my Netflix account from the Joey, and we streamed Guillermo del Toro’s Hellboy. Now in the near absence of ambient light, with just the glow of the fireplace, I at first wished I could turn the TV’s brightness down a notch. But my eyes soon adjusted as I was swept up into the story of the demon from hell who’s grown up protect mankind from the forces of darkness. When I went out to continue testing the TV the following day, I looked up to see to dark and angry-looking clouds gathering in the sky. As the wind kicked up, the temperature dropped, thunder sounded in the distance, and my Vivint home-security control panel started emitting a sound I’d never heard before. I went inside to see what that was about and found it flashing a tornado warning. I live in a rural area of northern California, and tornados are just about unheard of here. As the thunder got louder and lightning streaked across the sky, we heard a dull roar in the distance coming our way. The tornado never materialized, thank goodness, but a curtain of marble-sized hail moved across the pasture toward the house. It was soon pelting the TV; and by the time the storm had passed, there was enough ice on the ground to look as though it had snowed (an equally rare occurrence in this area). Needless to say, the TV survived the storm without a scratch, and I didn’t find any water inside its cable compartment. 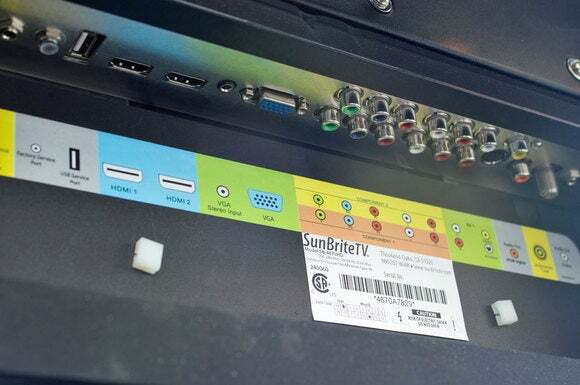 The Sunbrite SB-4670HD delivers only 1080p resolution, and it lacks a few features common to indoor sets of similar size that cost thousands less, but it’s the rare TV that can deliver a good picture outdoors in full daylight, though not in direct sunlight. And it can be left outdoors exposed to the elements without worry that rain, snow, insects or temperature extremes will damage it. It’s a luxury item that’s outside my budget, but that doesn’t make it any less cool. We’d slam the Sunbrite SB-4670HD if it were an indoor TV, but the fact that it can be permanently installed and watched outdoors is a remarkable achievement.